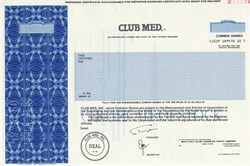 Beautiful specimen stock certificate from Club Med, Inc. printed in 1984. This historic document was printed by the Security-Columbian United States Bank Note Corporation and has an ornate border on one side with a vignette of the the Club Med Corporate Seal. This item has the printed signatures of the Company's President, and Secretary, and is over 32 years old. Club M�diterran�e, commonly known as Club Med, is a French corporation of vacation resorts found in many parts of the world, usually in exotic locations. It is considered the original all-inclusive resort.